In both of these repetitions, Trump's "believe" is about 60% longer than his "me", and the peak f0 on "believe" is about 40% greater than the peak f0 on "me". 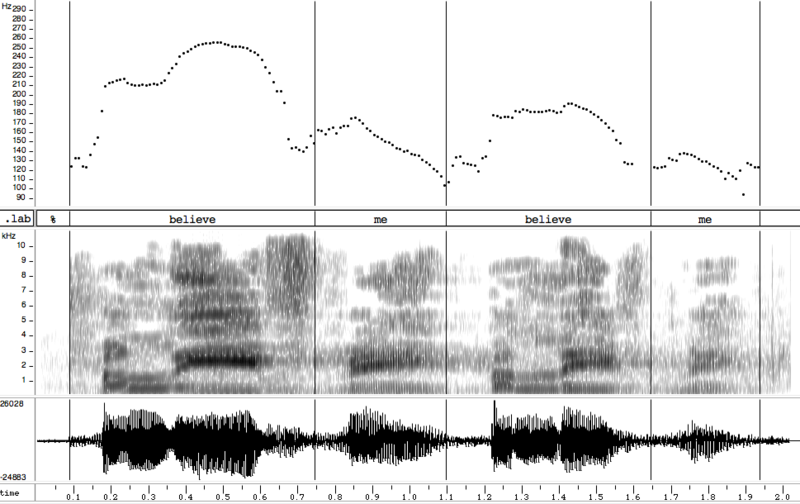 In addition, the fact that "me" has falling pitch throughout its vowel is consistent with the idea that it's de-accented, while the peak f0 in his first "believe" is about half way through the stressed vowel. In contrast to Trump's version, Kaine's "believe" is only about 20% longer than his "me", and the peak f0 on "believe" is only about 8% greater than the peak f0 on "me". 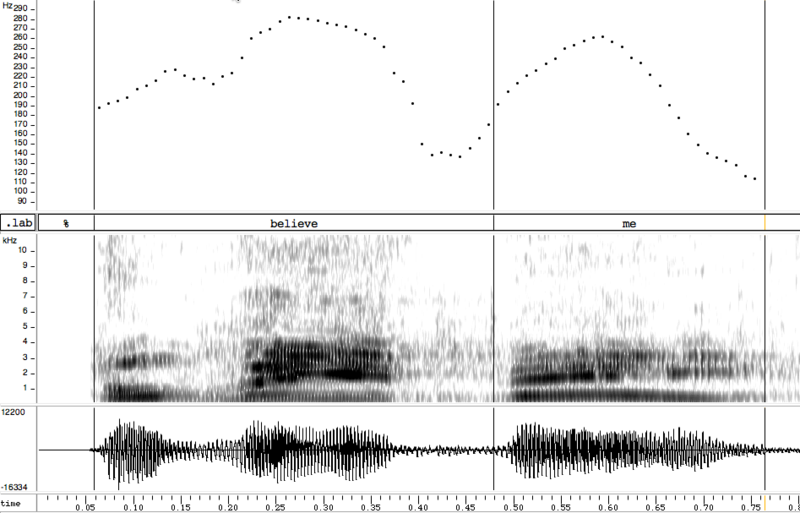 The fact that the peak f0 on his "me" is about halfway through the syllable is another indication that both "believe" and "me" are accented — and as a result of its striking rise-fall pitch pattern, maybe "me" is even focused. Kaine's "BELIEVE ME" carries the implication that you should believe the speaker, not all those other guys. Trump's "BELIEVE me" avoids acknowledging that any other opinions might be relevant. Another possibility is that Kaine's version is just overall more emphatic — or perhaps the result of treating the phrase as a quoted sequence rather than an epistemological aside. But the causes and consequences of prosodic choices are notoriously protean, and intuitions about prosodic meaning are notoriously unreliable. So how could we explore this question further? I'm pretty sure that Trump always de-accents "me" in his frequent uses of "believe me". And because "believe me" is so rarely used by other politicians, it's not going to be easy to find the basis for an empirical comparison in speeches and debate recordings. The LDC's published collections of conversational speech include 277 instances of "believe me", and this is enough to get a baseline idea about the relative frequency of different prosodic choices. I don't have time to inspect all of them, but in a random sample of 10, all of them had a prosodic pattern similar to Trump's. So I'm still looking for a way to isolate enough examples of Kaine's pattern — or maybe to create a situation that produces that pattern frequently enough — to evaluate its implications for communicative function. Also interesting is Trump's prominent clear [l] – that, despite New York's traditional reputation for having a darker-than-average /l/. And note, too, his variably fronted realization of /aɪ/: at times his "China" can sound like [ˈtʃʰæɪnə]. Totally the opposite of the New York [ɑɪ] that we hear from someone like Bernie Sanders. We often remark on Trump's New York accent as a trait that distinguishes him from the typical rich guy, but I suspect that he's adopted certain subtler features that distinguish him almost as much from the typical New York "poor guy" too. He shows some variable non-rhoticity – but I observed last night that Michael Bloomberg is a lot more non-rhotic than Trump, despite being a lot richer. I'm sure that Trump dropped more of his r's as a young man in Queens. I'm starting to find the man's accent almost as enigmatic as his rhetorical style and body language. I think it doesn't matter where the accent falls in most usages of "believe me" including most of Trump's, because it's used as filler or for emphasis, as in "what I'm about to say is important". After all, almost no one would ever imply "don't believe what I'm saying unless it's prefaced by 'believe me'". The fact that Trump says it a lot is just a quirk of his speaking style that happens to be exploitable by opponents, rightly or wrongly, as in "why should we believe you?" I would be curious to hear recordings of Trump in his college days and right after. He was sent to a boarding school before college (he went to Fordham and then Penn) – I expect he might have lost his outer boroughs accent during that period, or at least learned to code-switch to a more high status accent. I'm likewise sure George W. Bush didn't use that Gomer Pyle exaggerated twang when he was Phillips Andover and Yale. I would say that Time Kaine was putting prosodic scare quotes around "Believe me", to indicate that you shouldn't. @ Lazar – Bloomberg grew up in Medford (Meh-fid) Massachusetts, which presumably has some influence on his adult speech. that, despite New York's traditional reputation for having a darker-than-average /l/. Sounds like a classic hypercorrectivism. But that doesn't explain China. Well, NYC has a regionally marked [ɑɪ] for PRICE, rather like Cockney (cf. General American [aɪ] with a true central onset), so it's probably a reaction against that. It would be interesting to get the examples of the Kaine pattern, but while the Kaine prosodic pattern seems to be the pattern that is used in the common conversational interjection (or whatever it is) as might be found in, e.g., "Believe me, I tried" (with four high tones: H, H-F, H, H-F) (although the Trump pattern is probably also possible here), Trump's "Believe me" seems to be more substantive, a command to his followers to accept on his authority an assertion that they would not otherwise unquestioningly accept, and not just the common conversational stylistic device. The substantive contrastive case ("Believe me, not the other guy"), at least in normal use as opposed to the quoting context, would, I would guess, not typically have, or at least require, the high tone on the second (stressed) syllable of "believe". Kaine's iterations of the phrase carry no conviction. They end with a sort of uptalk, almost as though he were questioning HIMSELF when he says it. Trump's iterations are decidedly, decisively ending on a downward (like a Mandarin 4th tone) slope, as though he's trying to convince YOU of something. Mark, what program are you using to generate the prosograms? It doesn't look like Praat.